Kids now can step into the driver's seat to build their very own amusement park in a simulation developed just for them! Kids can choose rides like the Pirate Ship, the Super Coaster, and more as they build a theme park into a huge success! Earn money by playing eight logic and puzzle games, then use the money to keep adding onto your park! Fix the Rides: Customers don't like broken rides! Tend to maintenance alerts to repair broken rides to keep customers happy. Keep it Going: Running an amusement park isn't all about rides and games. Fulfill food orders, beautify the park with landscaping and more! Earn Money: Play eight different logic and puzzle games to earn money to build a bigger, better park with larger and more expensive rides and attractions! Make it Your Own: Control the look of the park - from its theme to the design of the rides to the landscaping and decorations. Blast off to save the I SPY Universe! The sun is fading and your help is needed to re-fire and restore it's glimmering light again! Only the generator on-board your rocket can save the sun. To power the generator, travel the depths of the universe to solve I SPY riddles to collect the 36 pieces to fix the generator! Along the way, earn fuel for your space travels by playing 6 brain-teasing puzzles. Space-themed gameplay immerses players with 12 planets bursting with I SPY riddles and games. 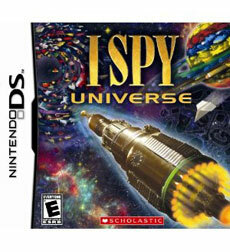 Unlock and solve I SPY riddles while collecting objects to light the sun and save the universe. 36 I SPY riddles set against 12 photo-realistic I SPY scenes offer over 400 objects to search and find. Six logic puzzles challenge players and unlock new planets to explore in the universe. Hint feature assists players in solving riddles and finding the most challenging objects. B absolutely LOVE'S playing with his Nintendo DSI XL, and as much as I like for him to have fun, I also prefer that if he is spending the time, that he's learning something in the process. As a mom Scholastic is a familiar name that I've come to know and trust over the year's. 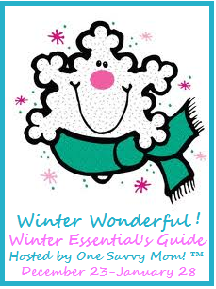 They publish wonderful children's book's, and have a variety of other fun products that are great for the kiddo's. 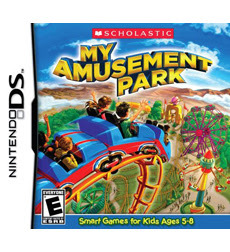 As I was doing a search recently for some new constructive game options for B, I was delighted to come across the new line of games for Nintendo DSI (Scholastic has also released a line of games for Nintendo Wii)! While offering tons of fun and interactive elements, these games are also offering learning opportunities. We received My Amusement Park, Digging for Dinosaurs, and I Spy Universe for review, and all became fast favorites! My Amusement Park offers several game play options that incorporate matching, memory, and spatial reasoning skills into the several games offered on My Amusement Park (each game is fashioned after Amusement Park favorites). Digging for Dinosaurs definitely spiked interest with B, as he is a HUGE fan of all thing's Dinosaurs and got to learn some fun & amazing facts while playing the game (between all of the great books, a favorite children's program, and now this great game, B definitely has amassed more knowledge about Dinosaurs than DH and myself have!). Next, we checked out I Spy Universe. Fashioned after some of the great I Spy Books - I Spy Universe offers so many opportunities to play and learn! Packed with fun riddles, and images to seek....this game could occupy for hours on end! B definitely has had a wonderful time playing these games, and as a mom I feel wonderful that he is LEARNING while he's playing! 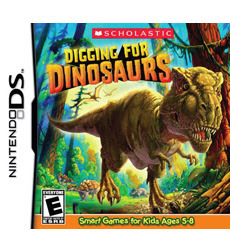 I would highly recommend these Scholastic titles for Nintendo DS, hours of Learning FUN await! I have the Digging for Dinosaurs game too. Can you figure out how to delete a player? My son wants to start all over and do more digging...but we can't figure it out! Thanks.